Call me psychic, but I know peaches are going to be on sale at your local grocery store soon if they aren’t already. They were on sale here earlier this week for $0.99 a lb. I usually wait until a fruit goes on sale and then make a yearly supply of jam. This year, it’s peach jam. Last year it was strawberry jam. I don’t make jam by the book. I hate preparing the jars in a water bath, cause I end up splashing boiling water all over myself and the kitchen. 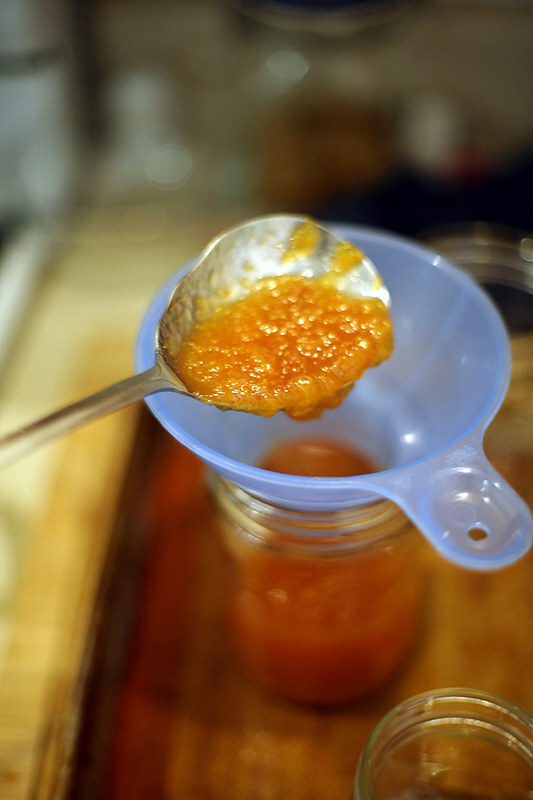 I don’t add sugar in a ratio of 1:1, and I don’t add pectin. I started with 9 lb of peaches. After cutting them into chunks, and getting rid of the pits, I was left with 4.7 lb. (I don’t peel the fruit). Mmmm… Now that I’m thinking about it, it might have been a little less than 4.7 lb. 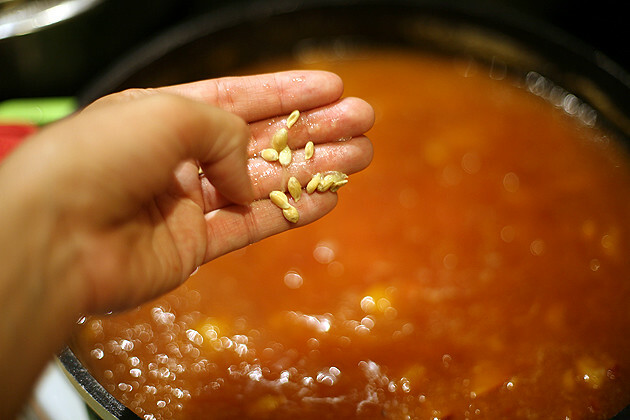 I add the fruit to a large pot and add sugar. I add a little less than half the weight of the fruit in sugar. So in this case I added 2 lb of sugar. Turn the heat to high and bring to a boil. Stir frequently. 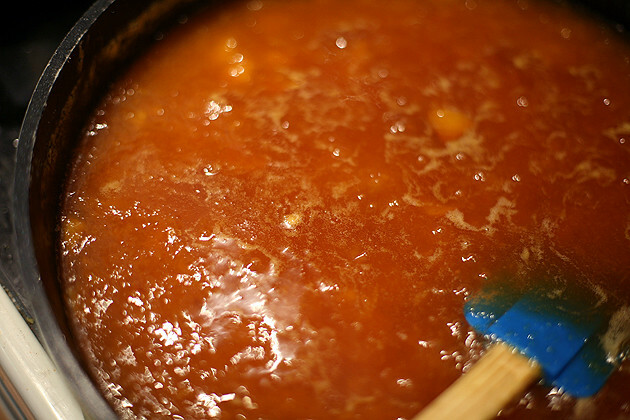 I left it at this stage for about 8 minutes, then lowered the heat to medium. 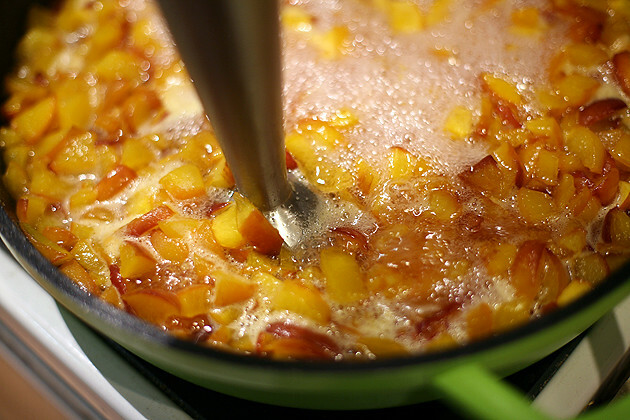 When the peaches are soft, I put my hand blender to work. You can mush it completely or just a little. However, you like it. I like my jam without big chunks. We are about 25 minutes in at this point. Don’t forget to stir frequently. Also, fish some of the foam out at this point. Next, I added the juice of half a lemon and it’s seeds. It’s a nice trick not many know about. The lemon seeds are full of pectin. 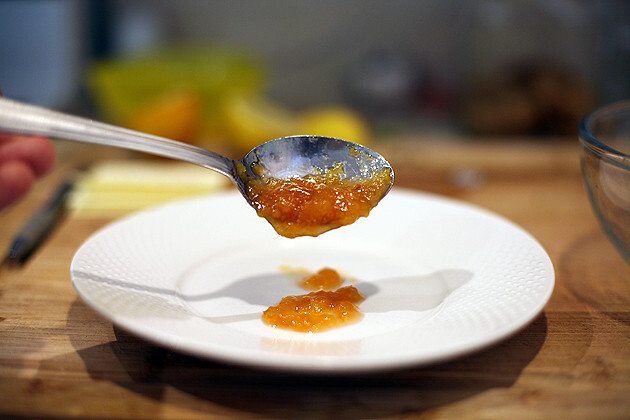 No need to buy the powder pectin, just throw a few lemon seeds into your jam and they will thicken it for you. 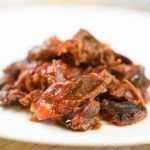 You can place them in a cheesecloth or simply throw them in. I just throw them in and try to remember (this time I failed…) to fish them out before I transfer the jam into the jars. So, the jam is cooking for about 30-35 minutes now (don’t forget to stir), and it’s time to prepare the jars. This is very easy. No need for huge pots that take a whole kitchen cabinet, tongs or what not. 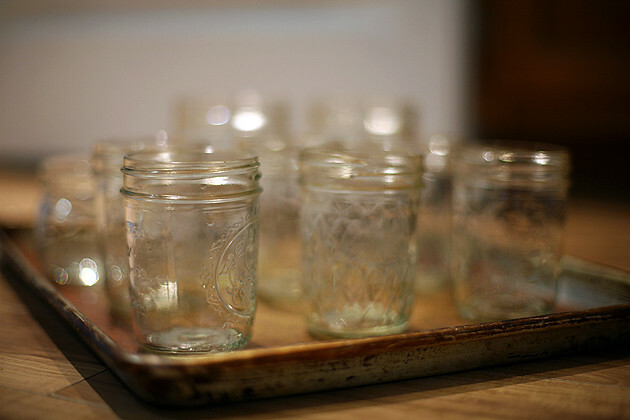 Simply heat your oven to 320F, place the jars on a baking sheet and stick in the oven for 10 minutes. Meanwhile, place the lids in a bowl of hot water. After ten minutes, take the jars out of the oven and set on the counter. 50 minutes in, and it looks like the jam is ready. It’s a bit tricky to learn how to recognize this stage. 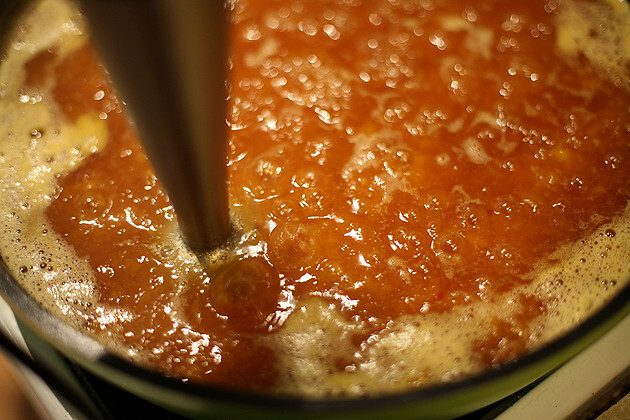 If you over-cook or under-cook a few jams, it’s totally normal. I make a spoon test. I spoon a tablespoon of jam and let it cool for a couple of minutes. Then, I let it drop to the plate and watch the thickness. 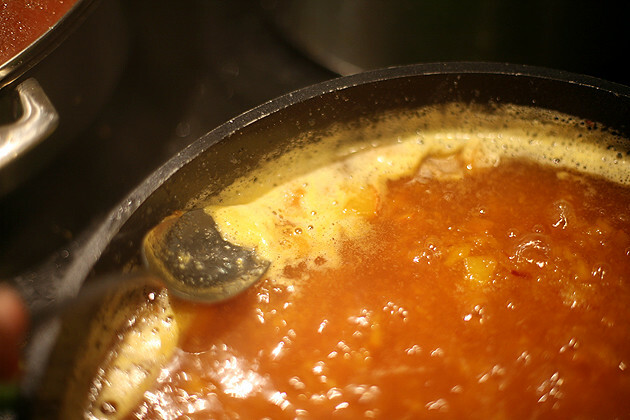 Take into consideration that the jam will thicken more when cool. Leaving one centimeter of head space. This is important, too much or too little headspace, and your jars won’t seal. Make sure to dry the lids with a paper towel and clean the rim of the jar before covering the jar with the lid. The rim and the lid have to have complete contact to seal properly. I also place the ring at this point, but very loosely. Place the covered jars on the counter to cool. In the next few hours, you will hear the ‘pop’ which signals a successful seal. After a few hours, when the jam cools down, you can check the seal and tighten the rings. If you find that one of your jars didn’t seal, just place it in the refrigerator, it will last until you are 90, but I bet you’ll eat it before then. That’s it. Store the jars in the pantry. Keep open jars in the refrigerator. Note: you can start with any amount of fruit. 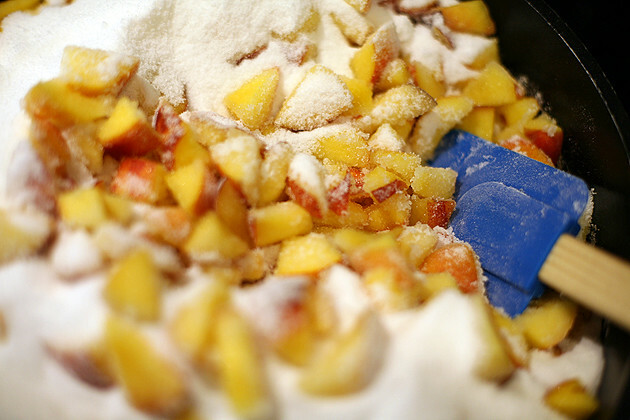 Add half the weight of the fruit in sugar. Add lemon juice and lemon seeds. The only thing that is going to change is the cooking time so keep a close eye on the pot. Next time toss in some pre-soaked & strained Tapioca. I soak about a cup per batch. Does it change the flavor much Sheri? No change in flavor at all! Little story: Years ago I met a very old woman from war torn Europe. During the war years it was hard to make jam & jelly and the ladies discovered using Tapioca brought wonderful results to their jam. 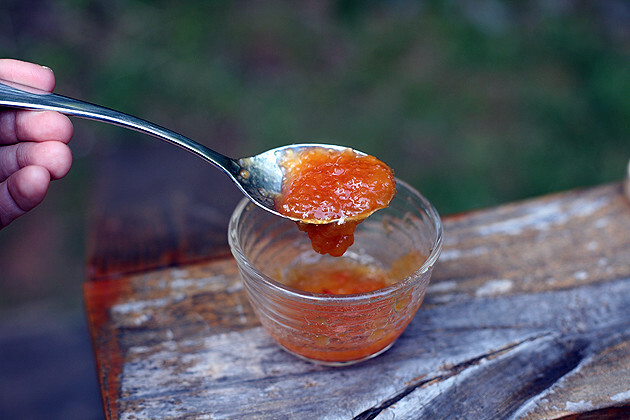 The first time I tasted this done was Adelle’s Apricot Tapioca jam. It’s just wonderful! Also what I discovered was that if you put your fruits through a juicer and put the juice back with the fruit body pulp it doesn’t require any pectin. 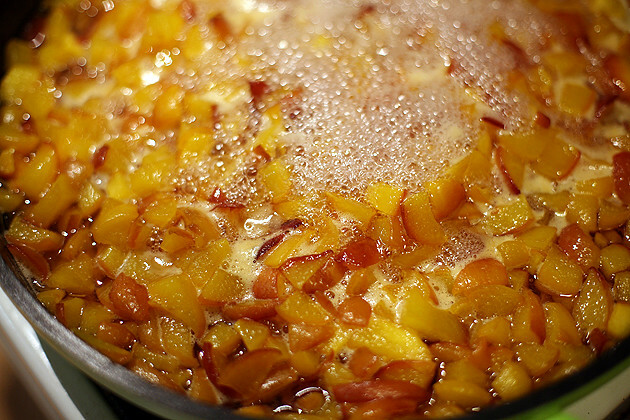 Pectin is actually “fruit fats” so by pulverization it releases the fats to heat and re-bond. Do realize that some fruits don’t have as much fruit fats as others so when I make eggless lemon curd I use my tapioca as a thickener. Yum! Sounds good. If to be honest, I don’t think I ever ate tapioca. I’ll have to try this. Thanks. I am all about easy Chris! Thanks for pinning. Do you not peel the peaches? 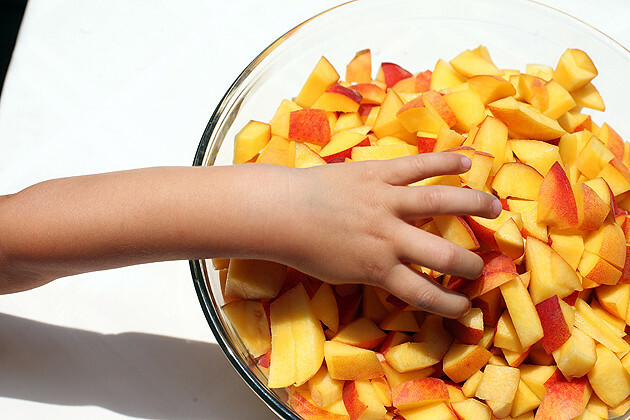 The ones you have chopped up in the bowl look more like nectarines than peaches. I’m not sure I’d want that fuzzy peel in my jam. Otherwise I love the method and may try it this year. Yes, some of them were nectarines, but I do the same thing for peaches. 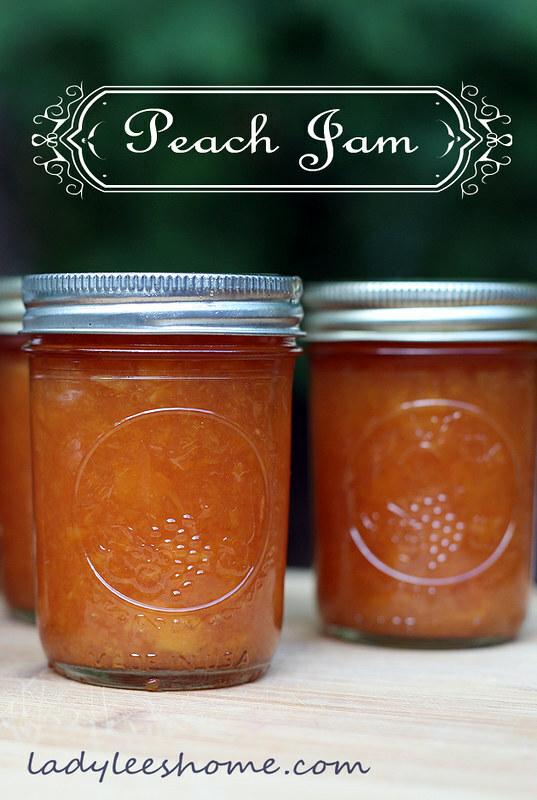 I don’t peel because I don’t mind the peel in my jam and it is much less work to just leave it on, but you can peel the peaches if you want. Doesn’t change a thing. I made 1/2 of this recipe on August 25, 2015. 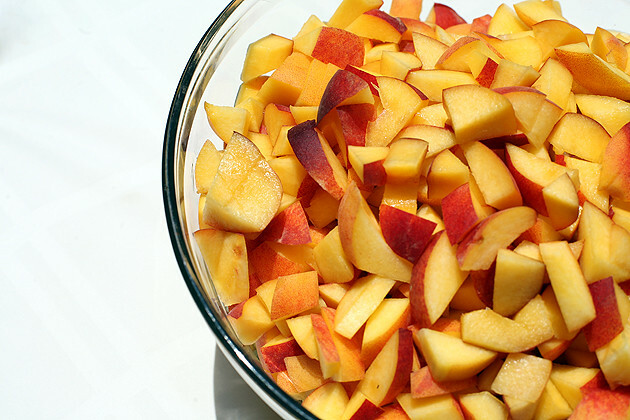 I was easy to cut up peaches and I added even less sugar since hubby is diabetic…..it is DELICIOUS! I am so glad I tried jam with the skins on, and the lemon seeds worked wonderfully. Thank U. Awesome! So happy to hear that you liked it. You can try different ratios of fruit and sugar. I never do the same thing twice. Sometimes I have fruit that I see is going to go bad so I make jam from it, even if it’s just a little bit to keep in the refrigerator. If your husband is diabetic you can even try to make this without sugar at all. Maybe add half a cup of honey or so. Have you ever canned black berry jelly like this? I can’t wait to try the lemon seeds! Pectin has become so expensive. Margaret, I make all my jellies this way. Strawberry, cranberry, peach, blueberry… I never made a blackberry jam before but I don’t see why it won’t work. Thanks for visiting! I didn’t know this about lemon seeds. Do they have to be fresh? Or can you save them up and dry them? I never tried it because I always have so many lemons around, but I don’t see why it won’t work. You can try to dry a few, then drop them in a cup of water for a few minutes. Fish them out and see if the outside of the seeds feels like it’s covered in jelly. If it is, it will work just fine in the jam. Women are so smart! thanks to our host and all of those phenomenal replies, I learned a lot and I’ve been a professional chef for over 25 years!!!! 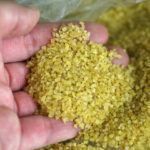 I knew about the oven processing, and most of the other tips, but not about the tapioca, or lemon seeds for thickening! very cool, can’t wait to try it. May I offer another way to quick “can” something intended for refrigeration, perhaps for a bit longer than refrigerator storage? It’s the way Italians do it: process the jars as above, add the hot fruit jam, put the lids on as you described, then after sealing, turn over the jars onto a clean towel surface. That, too creates that “pop” which tells you it’s sealed, but I put these into the fridge for long term storage. Keep all those tips coming, ladies, it was great.. Thanks for the tip! I’ll try it next time. I am staying in Dar Es Salaam and we have many problems to bring in seeds or plants from outside our country. I am interested to out dwarf fruit plants in my farms. Can u explain me how I can do it using our fruit trees locally . Will appreciate your earliest reply . By the way I really liked the explanation on the ham. 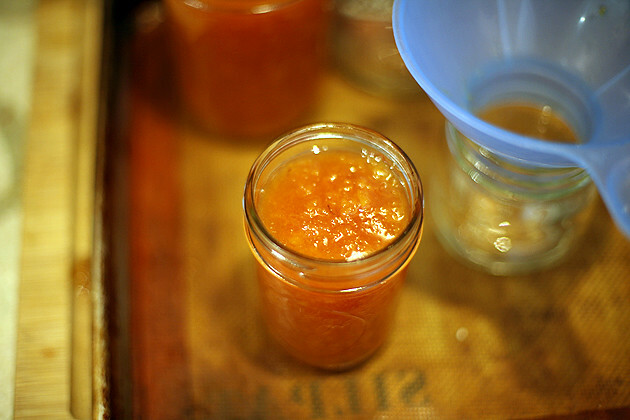 May b I should do a test on mango and pine apples jams now that the season is on . Will this work for grape jelly. BTW thank you for the new way to go natural. I made your strawberry and chia jam earlier. Should work for any jam or jelly! Thanks for the recipe. I used Blackboy Peaches and looks good. Apple cores can be used as pectin too. Robyn, apple cores with the seeds? Or seeds removed?